Scott Patterson broke his big toe about two months ago when he crashed while cross-country skiing at Eagle Glacier. The injury knocked the Olympic skier out of the Mount Marathon race and compromised his training for several weeks. When his toe finally healed enough to allow him to toe the line in a race, all he did was make history. Patterson, 26, won the Crow Pass Crossing men's title for a record-tying fifth time Saturday while running the seventh-fastest time in race history. "How big a bone would you have to break two months out and NOT win this race?" runner-up Allan Spangler asked Patterson at the Eagle River Nature Center finish line. Patterson finished the 22-mile backcountry marathon in 2 hours, 59 minutes, 35.5 seconds. Spangler followed in 3:02:52.3, with Colorado's Zach Miller placing third in 3:05.22.1. 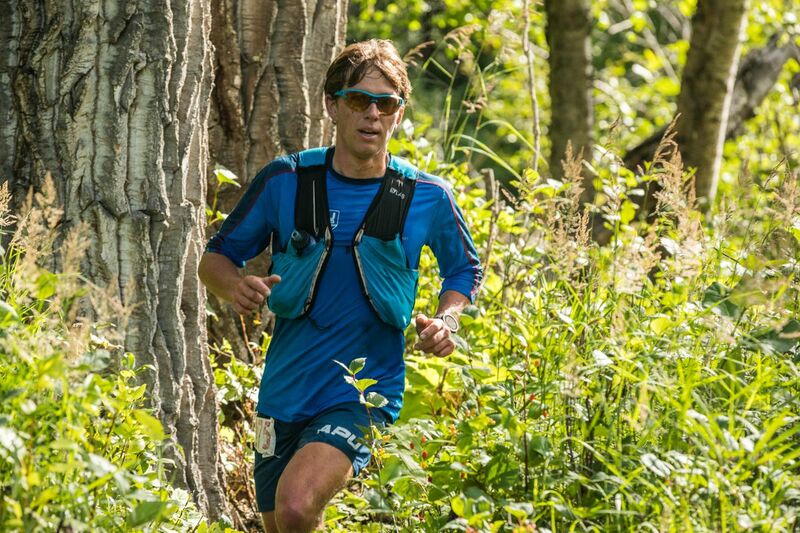 Miller is a star of the ultramarathon and trailrunning world and was one of two highly regarded Lower 48 runners in the race through the Chugach Mountains. Oregon's David Laney, Ultrarunning Magazine's runner of the year in 2015, placed ninth after rolling an ankle during the arduous wilderness race from Girdwood to Eagle River. Miller has raced all around the world but said he has seldom encountered anything like Crow Pass. 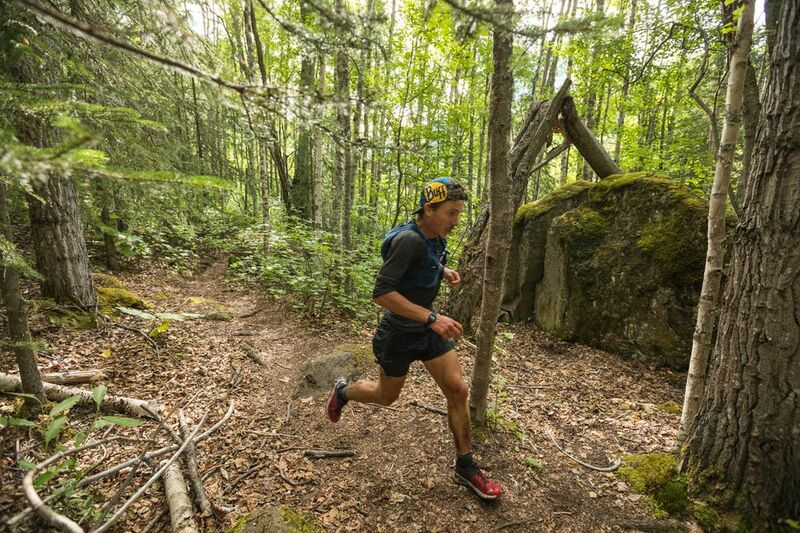 The race begins with a 2,000-foot climb in the first four miles and then heads mostly downhill after that, taking runners over a couple of snowfields, through tall, thick vegetation, across thigh-high Eagle River and over twisting, technical terrain covered with rocks and roots. "That was wild. That was cool," an exuberant Miller said after crossing the finish line. "It has a lot of things you normally have in a (mountain) race and they aren't that bad in this race," he said. "But it's the unmarked course, the vegetation, the twisting and turning, the rocks. "We're going downhill for 10 miles, and it's the hardest 10-mile downhill you've ever done." Miller led the charge up Crow Pass at the start of the race, something Patterson typically does. The two were close when they reached the top of the pass, but Patterson gained ground when Miller encountered two small snowfields. "He was really bad on the snow," Patterson said. "I was a pansy," Miller said. "I was just kind of a scaredy-cat, and (Patterson) was bounding." Patterson finished five minutes off the 2010 record of 2:54:44 set in 2010 by Geoff Roes and more than three minutes off his personal-best of 2:56:13, which ranks as the second-fastest time in a race that dates back to 1984. He had hoped to challenge the record, especially with Miller and Laney there to help push the pace. "I was fast to the river and I felt pretty good about that," Patterson said. "I was running solid for about a half hour after that and then I started feeling it. Coming off a broken toe, I don't have a lot of running endurance." Patterson, who placed 11th in the 50-kilometer race at February's Winter Olympics, said his high-intensity workouts have been limited to 30 minutes in the weeks following his injury. "It's definitely been debilitating," he said. "The toes are pretty important for classic skiing, so I've been trying to take it chill." Heels are probably pretty important too, which is something Luke Jager is about to learn. Jager, an 18-year-old Crow Pass rookie who is a top nordic skier, finished with agony etched on his face. His feet looked even worse – chunks of skin flopped from both heels, which had turned entirely to blisters. The blisters formed in the first hour, said Jager, who placed 10th in 3:23:32. "The last 15 minutes were pretty dark," he said. Ben Marvin grabbed fourth place and Lyon Kopsack was fifth to give Palmer runners a terrific showing. Four of the top eight finishers hail from Palmer – Marvin, Kopsack, seventh-place Tracen Knopp and eighth-place Cody Priest. Representing for Wasilla was Spangler, who grew up in the Valley but lives in Juneau now. Christy Marvin, the women's winner and Ben's wife, said she was happy to see top Outside runners at Crow Pass, just as she is happy to see top Outside runners at Mount Marathon, where earlier this month David Norris outdueled professional runner Max King of Oregon. She was even more happy to see the locals shine. "I love that the Alaskans have kept our races," she said. "We have to welcome the Outside racers because they bring the level of competition up a notch, but I also love it when the Alaskans win." Patterson's victory ties him with Michael Graham for the most wins by a man. The winner of five of the last six races, he said Graham's record wasn't on his radar. "I always hear about Nancy Pease with nine," he said.